By now, you've surely heard all the news about the upcoming CBA-R35 GT-R. You know it has a 3.8-liter twin-turbo V6, 473bhp and 434lb-ft of torque, a rear-mounted twin-clutch transmission, Brembo brakes, Bilstein suspension, sticky tires and that it's going to be released in the US sometime next year. You've been bombarded with pictures, websites, articles and videos. No doubt, just 28 pages ago in this very magazine, you read that it'll sprint from zero to 60mph in 3.5 seconds and run the quarter in the 11s. 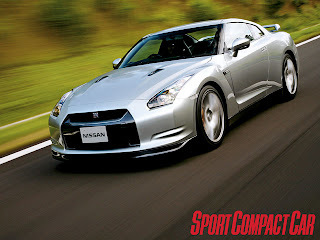 But how will the GT-R fare when it goes on sale and the aftermarket gets its hands on it? Naturally, horsepower is a necessary requirement and the GT-R comes on strong with two IHI turbochargers, connected to an all-new 3.8-liter V6 engine. According to Hiroyuki Ichikawa (from Nissan's Powertrain Engineering Division), the all-aluminum VR38 is based loosely on the VQ-series, but is different in almost every way. The casting is completely new, and the fully closed-deck unit uses plasma-coated cylinder bores to balance strength and weight. The VR uses twin throttle bodies ( la VQ35HR) and a single mass airflow sensor to meter air, which should help keep things simple on the ECU tuning side. What won't help is the drive-by-wire system controlling both throttle bodies. Pretty good technical article breaking the 2009 R35 GT-R down. that magazine hasn't printed anything useful or original since Jacquot, Coleman, and Holstein left. seems most of what they print is the dribble they rip off by rewriting the technical bulletins of aftermarket brochures made by people trying to sell thier goods.